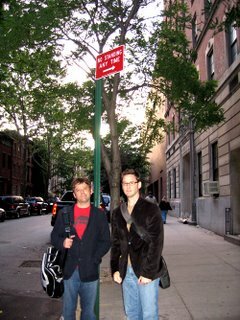 Here is a photo of Going Interactive’s Doug and Jason Davenport on the streets of the Big Apple at the AIGA MOVE3 Conference in NYC in May. At the conference we were inspired by the likes of Scanner, Adult Swim guys, Laurie Anderson, Jean-Paul Goude and more. Thanks to AIGA NY for putting this event on. Unfortunately we didn’t make it to that new cool new Apple Store on 5th Avenue!